A few years ago, our mature blueberry bushes seemed to lose their stiffness, producing arching limbs that should have been straight. All of the plants in one plot were affected, though we had not changed the way we cared for them. Could something have happened with the soil pH? Blueberries require acidic soil to grow well, so a pH nudging toward neutral is one of the first possibilities to rule out. Using woody mulches helps maintain acidic soil conditions for blueberries. Oh, joy. This problem gave me a reason to get out my soil testing stuff, which makes me feel like a sixth grader with a new chemistry set. Most garden suppliers sell inexpensive pH test kits or digital meters, which are super simple to use. Whether you choose a probe type digital meter or tests where a soil sample is mixed with water in a reactive solution, testing your soil’s pH is a fun way to discover this secret aspect of different areas of your garden, or even large containers. The pH describes the relative acidity or alkalinity of soil, which has huge implications for plants. Soil pH affects plants’ abilities to take up nutrients, as well as the balance between soil fungi and bacteria. Rich, moist soils with a slightly acidic pH host more life forms compared to soils that are very acidic (peat bogs) or alkaline (limestone outcroppings or deserts). 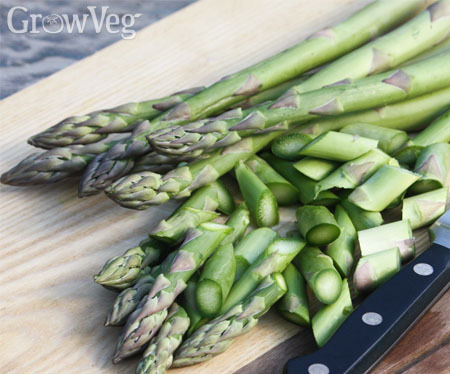 Asparagus can adjust to alkaline soil better than most other vegetables. The pH of native soil varies with climate. Most soils in the USA range between 4.0 (very acid) and 8.5 (very alkaline). The acceptable pH range for a productive food garden is about 5.5 to 7.5, with a pH of 6.0 to 6.5 preferred by most food crops. There are exceptions, with potatoes and most berries growing best in acidic soil, and asparagus and cabbage family crops happiest in near-neutral conditions. The chart below shows the pH preferences of popular vegetables and fruits. The pH of soil is easily altered within limits. When combined with organic gardening practices like using compost, mulches and organic fertilizers, lime (for acidic soil) or sulfur (for alkaline soil) can change the pH by 1 to 1.5 points over a period of several months. In beds or large containers, using lime or sulfur to correct extreme pH problems is easy and effective. Too much of either substance can burn plant roots, so be sure to follow the label instructions for how much to apply. Light applications of wood ashes work like lime, and should only be used on acidic soil. Simply gardening tends to have a neutralizing effect on soil pH, as does using compost and mulches. The pH of alkaline soil can be quite stubborn, but alkaline soil that has been improved with composted manure, vermicompost or other materials that are rich in humic acids can grow a very productive vegetable garden indeed. My blueberries did have an elevated pH problem, which probably developed when veggie beds higher on the slope were dusted with wood ashes, which has a liming effect on soil. I’m happy to report that two years of mulching with pine needles and wood chips (and steering clear with wood ashes) has fixed the problem. The mystery is solved. "Thank you, Barbara. Very helpful. 2 of my young blueberry bushes also showed signs of problems with the soil, but the problem turned out to be a fungus infection. I removed these 2 plants. Now the other blueberries seem to be doing fine. "